It is divided into sections according to her books (Introduction, Sense and Sensibility, Pride and Prejudice, Mansfield Park, Emma, Northanger Abbey, Persuasion and then the usual things such as a Bibliography). 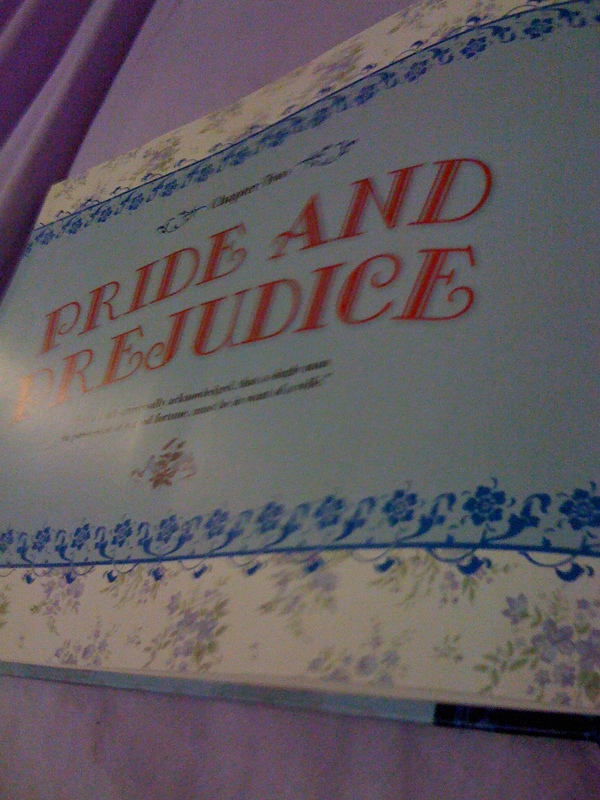 Of course, I’m going to focus on the Pride and Prejudice section mainly… because that’s the sort of weird thing we do here! Following Austen’s life around the time she wrote Pride and Prejudice, we really get to see a different side of the novel through this chapter. We hear from Dickson that it’s her “darling Child”, the one she loved above all her other books. 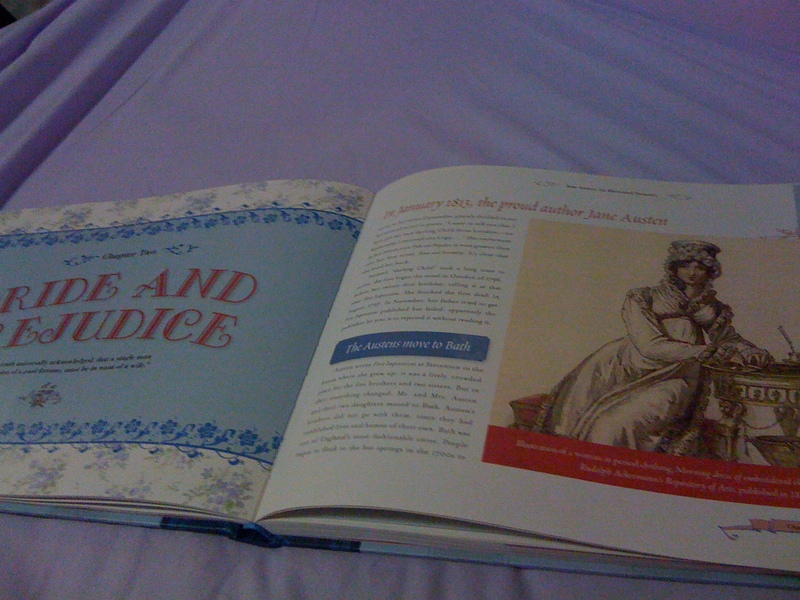 Throughout the chapter we follow her to bath, and then become involved in a discussion about the themes in the book (Marriage and Money and Family Values) as well as meeting the characters, social norms and some absolutely gorgeous paralleling of what happens in the novel to what happens in Austen’s own life (proposals et cetera). We hear about the publishing and editing history of the novel, originally First Impressions, to its final form. While the re-capping of the book is momentarily tedious here and there, there are enough new insights to keep it readable (such as snippets about the laws of the time and the rules of the era). However, the real beauty of this chapter is in the illustrations. Firstly, almost every double page has some image on it. Some of them are from different film adaptations of which there is some discussion (the 1940s version with Greer Garson, or the BBC Colin Firth version), however there are also paintings from the 18th and 19th centuries that bring you right into the feel of the era- by placing you in the artistic context showing the style of clothing and so forth. Secondly, the removable memorabilia of this section is of “Illustrations by Hugh Thomson from a 19th century edition of Pride and Prejudice” that I have been eyeing up enviously for a very long time on the internet. 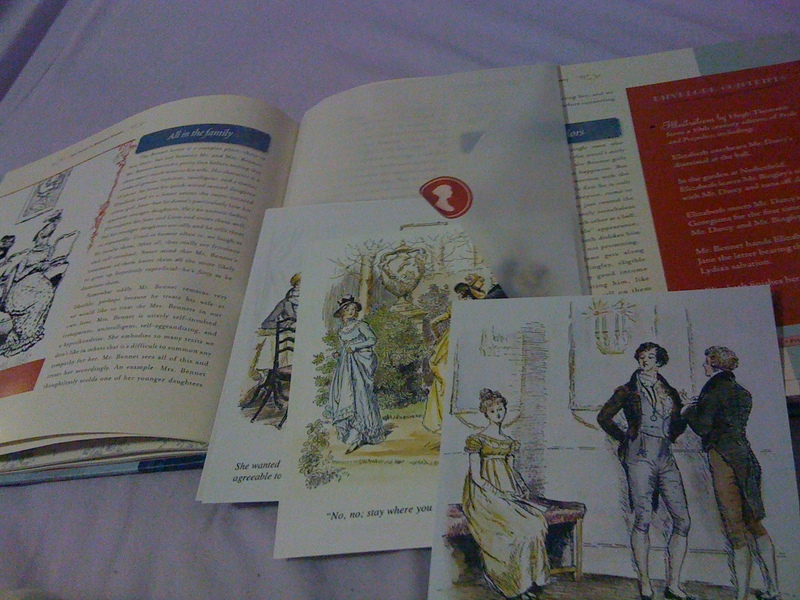 There are five separate illustrations, all kept in the book in a translucent envelope sealed with a sticker with Austen’s silhouette on. Each is accompanied by a line at the bottom demonstrating when the picture seen takes place within the novel. They are breathtaking, and very elegant. I was extremely happy to see them in the book! The other detachable items within the book are also pleasing, and well-executed. The right sort of paper has been used so while they are obviously reproductions of her letters and so forth, you can get quite immersed into it, rather than feeling like a child in a crap souvenir shop (as frequently happens with other interactive type books). 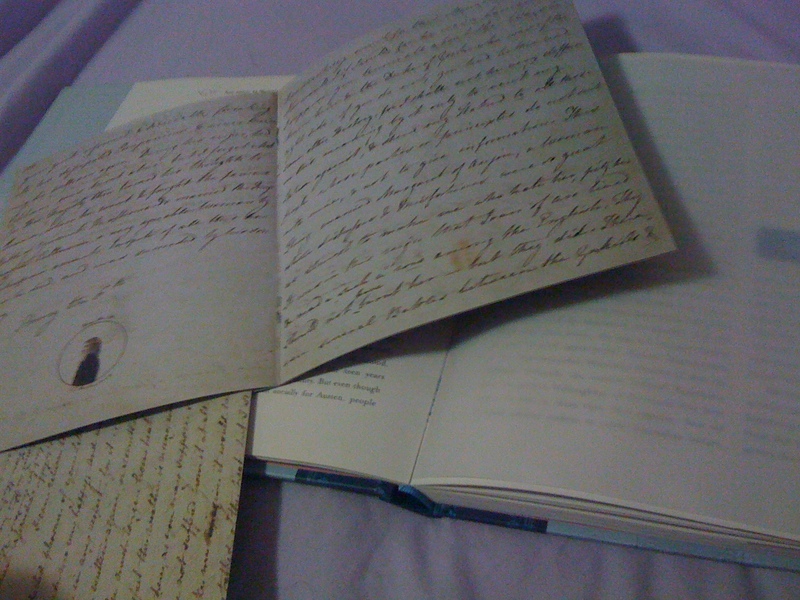 There are mirror-writing letters from Austen to her niece, handwritten poems by Austen, a sketch and a watercolour of Jane, a silhouette suggested to be of her, pages from her Juvenilia “The History of England” and more, each spaced throughout the book. My main criticism with the book would be about the tone. It often feels as though it is written for people who have little knowledge of Austen or who have not read the novels. I can understand why this has been done- meaning it can also be introductory material to the novels as well as a nice gift to a Janeite, but I felt it could have served better taking it from another standing. All up, it was a really nice read, and only set me back (AU)$29.99, which I think is a really good price for such a book. Have you read it? Did you enjoy it? Is it on your wishlist? I love love love this book! It is indeed a treasure! I loved the images and many docments enclosed. Lovely review! 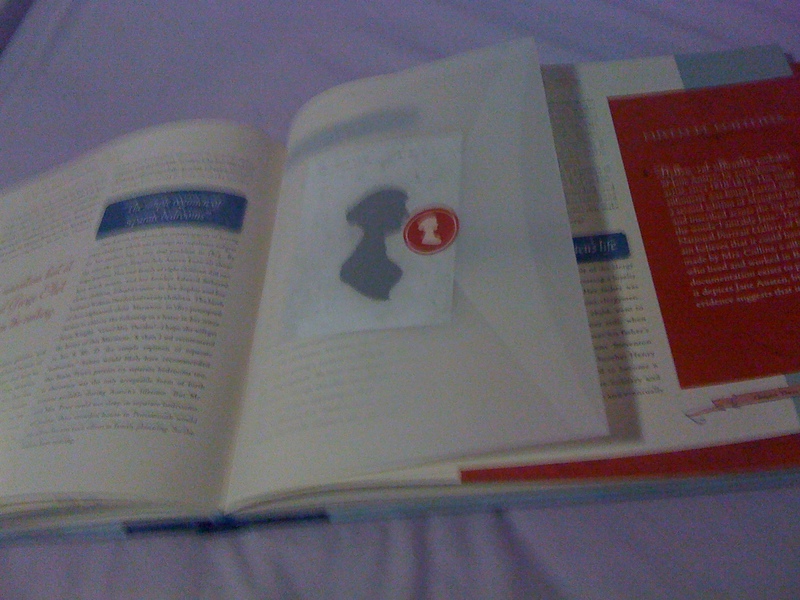 i like the interactive-ness of the book.